Martinsville Bulletin Photo by Ben R. Williams: Danny Wulff delivers the keynote address during the annual business luncheon. 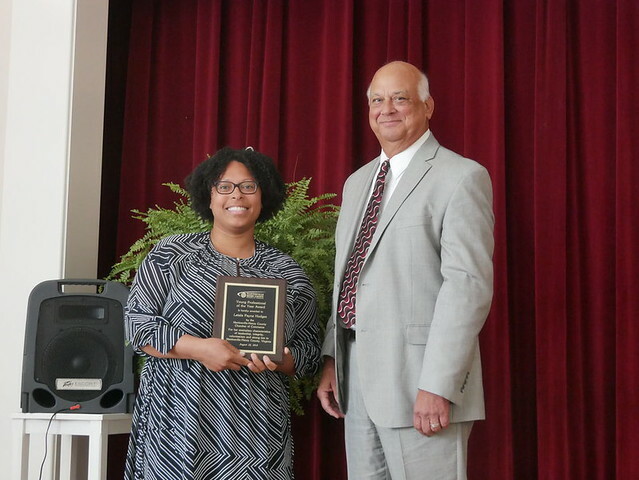 The Martinsville-Henry County Chamber of Commerce honored Latala Hodges, communications director, at this year's annual business appreciation luncheon at Spencer-Penn Centre Tuesday. Hodges received the Young Professional of the Year Award, along with Blake Collins, vice-chair of economic development, for the Chamber. Serving as the keynote speaker for this year's event was Danny Wulff, foundation board member and owner/operator of Chick-fil-A in Martinsville. Latala Hodges of The Harvest Foundation received one of two Young Professional of the Year Awards from chamber chairman Ron Haley.